The Minxes returned to school this week, and I must say, it was the first time in quite a while that I wasn’t ready to see them head back to school after a break. We had a nice, low-key holiday filled with baking and movies and lunches at favorite places. The girls were healthy (amazing, since the flu has really hit our state hard) and cheerful and willing to help out around the house. They treated each other with kindness and good humor and they actually tolerated my goofy, dorky self. This was a pretty tall order, because we spent a lot of the 2 week holiday battling snow and icy roads, so we were cooped up together a fair amount. But all good things must end, so they grumbled and trudged back to school on Monday. I busied myself Monday morning by making an enormous grocery run and doing laundry and getting the last of the Christmas decorations ferreted away, but around 2pm, I started to feel a little lonely. I found myself glancing at the clock every ten minutes. I missed them. Still, my plight was not nearly as sad as the Mozz-man’s. He really had a tough time finding his balance on Monday. He’d gotten used to a much higher level of noise and activity, and he spent most of Monday morning wandering from room to room, looking for the girls. He also missed getting constant cuddles and belly rubs and little stolen snacks, so he needled me incessantly for attention. He drove me a bit crazy, to be honest. At one point, I just had to wave the white flag and flop down on one of the girls’ oversized bean bag chairs (Christmas presents) and make out with the Mozzerator for half an hour. He’d have preferred an all-day smooch-a-thon, but I had things to get done. Most of this week, while the girls have been gone, he’s chosen those bean bag chairs as his prime lounging spot, and I’ve left the t.v. on in the playroom for a little background noise. It’s not quite as good as having the girls around, but it’ll do. 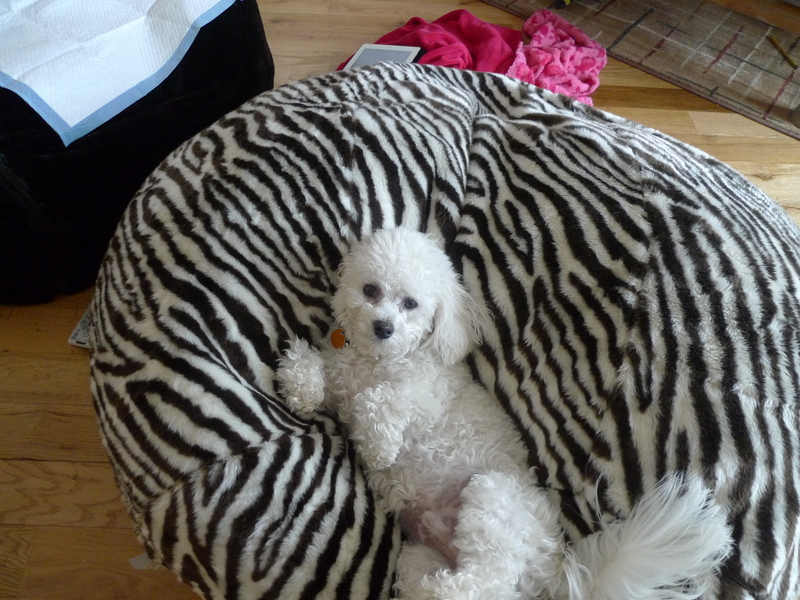 ^Yeah, that is a potty training pad on Miss D.’s bean bag chair. The cat no likey them. Pisser! I got a few new cookbooks for Christmas, which is always exciting for me. I don’t really need more cookbooks in my life, but I’m an addict…what can I say? I just love flipping through a new cookbook, searching for inspiration. One cookbook I’m particularly intrigued with is a Williams-Sonoma cookbook called “Quick Slow Cooking” by Kim Laidlaw. The winter months are ideal for stretching your limits with the slow cooker, and as soon as I saw a recipe for beef pho in there, I was psyched. Since my neighborhood pho joint rudely went up in frigging flames a few weeks ago, I’ve had to rely on my own devices to get a pho fix. 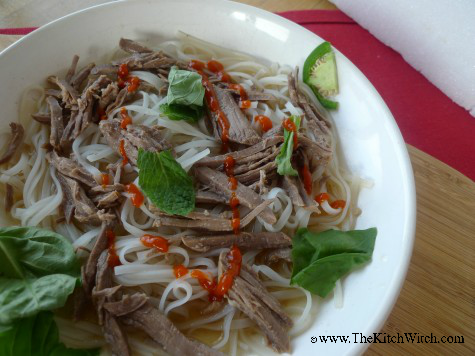 Making pho in the slow cooker sounded like a dandy way to test drive my new cookbook. The idea was kind of novel, since normally, when I make pho, I barely cook the (thin slices) of beef, plopping the ruby-colored slices into my soup bowl and allowing the hot broth to basically cook the meat. The slow cooker method braises the meat for 8 whole hours! One definite bonus to making pho in the slow cooker is that the enticing aroma of cinnamon, ginger and star anise infuse the kitchen all day long. 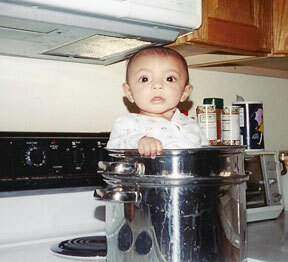 By the time dinner rolled around, I was ravenous. I attacked my bowl of Vietnamese Crack like a starving badger. It was delicious. Because of that long braise, the broth was much more complex and rich-tasting than my usual Faux Pho. If I’m not pressed for time, I’m going to make the broth in the slow cooker for sure. And the meat? Oh, it was a revelation. It was melt-in-your mouth tender, much like a brisket. Because of that long braise, the meat was infused with the flavors of the broth–I seriously could have just eaten a pile of the beef for dinner and been a happy girl. But of course, I wanted the whole pho enchilada–broth, noodles, herbs and a whopping dose of Sriracha. Because baby, it’s cold outside. If you’re looking for something to warm the marrow of your bones this winter, give this recipe a try. It’ll shiver your timbers. In the slow cooker, stir together the broth, Worchestershire sauce, onion, fish sauce, cinnamon sticks, star anise, ginger, sugar and salt. Add the steak, cover, and cook on the low setting for 8 hours. The steak should be meltingly tender. Transfer the steak to a cutting board and let rest for ten minutes. Shred into bite-sized pieces. Line a fine mesh sieve with cheesecloth and strain the broth. Discard solids. Return the broth and the shredded meat to the slow cooker, cover and warm through on low for about 20 minutes. Meanwhile, prepare the rice noodles according to package directions. Taste broth for seasoning. I ended up adding a pinch more sugar and fish sauce, and about a tablespoon of oyster sauce for depth, but do as your palate guides you. To serve, pile noodles into individual serving bowls, top with beef and broth, and serve with a platter of accompaniments. You’re the best mom! I always wanted a bean bag chair growing up! This looks awesome. I can almost smell the broth from here! Love the bean bag chairs and Mozzy all snuggled up in them too. I’m not a meat girl, as you know, but I grew up with my own bean bag and totally miss it! As a side note, my dog had his own and my mom’s dog has his own, too ;) That picture is priceless, and glad you were able to finally enjoy a vacation. Whew. I just emailed this to myself so I can print out the recipe and get this on my menu pronto. This winter I am all about the soups. The slow-cooker cookbook is a winner! Next up on the list of recipes to try: ropa vieja! Typically I’m team Ramen these days, but Michael is determined to get a slow-cooker so if he finds one he likes, I’ll suggest this as a way to break the thing in. The idea of smelling ginger, star anise, and cinnamon in the air is a very appealing one, I have to say! Definitely get one! It’s so nice to plop some stuff in your cooker in the morning and come home to a wonderful smell. You do need to get one! They have some fairly inexpensive ones on the market that are remarkably good for the price. Let me know if you need recommendations! I got a bean bag chair for my 12th birthday…you know, back in the early 80something when those were HOT to have. I honestly didn’t know you could still get them. Zilla would love that zebra one in her pink and zebra and floral room. Sounds bizarre, but somehow she made it work – my little designer. 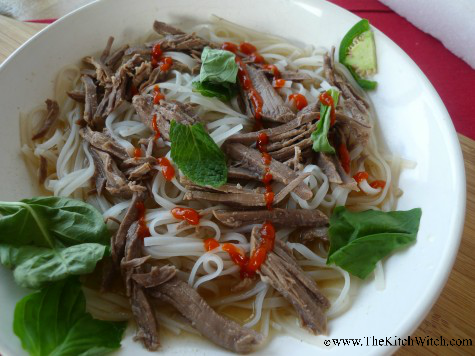 I like pho a lot, but what I do not like about it is how pale the beef always seems. That bugs me. And browning it first just seems to counterproductive to the slow cooker process. And now that we are in Daisy Scouts, meeting night is slow cooker night so I’m on the hunt for things to make. Yeah, the beef is pale, usually because those thin slices are put in RAW and the broth basically just poaches it to rare. It is a little funky looking. That looks sooooooooooooo good. I could do with a little warmth. I’m so behind on your posts! Gee…I wonder why?? Hahaha! I’m so glad you had a great break with the girls! !